Disclaimer: As a Private School student in high school and then an educator at a Detroit Private School last year, I’m woefully ignorant when it comes to the discourse surrounding Detroit Education. Lately, I’ve been interested in learning more and, more importantly, inspiring others to do the same. Check out some of my initial “gut thoughts” below. 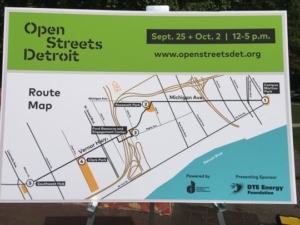 A couple of weeks ago, Challenge Detroiters were tasked with participating in Open Streets Detroit. Open Streets advertises itself as an international movement to re-imagine urban space – particularly, how we move and traverse through city streets. How would your experience of Detroit, New York, Chicago, Toronto — be different if you didn’t have to look over your shoulder as you bike down the road? Per usual, the Fellows were divided up into groups, with each team tasked with creating a pop up along the Open Streets route that would encourage participants to think about their streets in a new way. 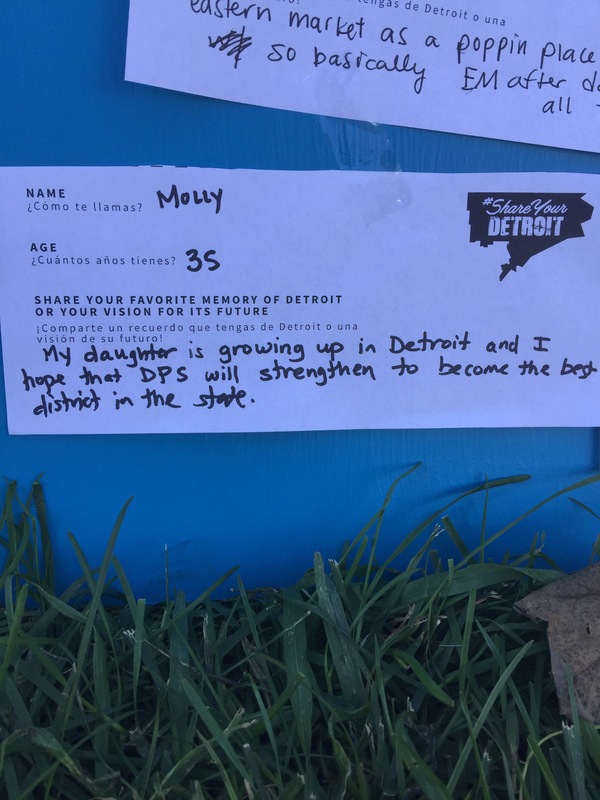 My group decided to ask a question – “What’s your Detroit story?” We had a ton of responses, but I latched on to the one shown in the picture above. In the past year, Detroit’s negative national perception reared its ugly head. Between the teachers’ strike, school closures, and hugely discouraging communication gaps in-between all of the stakeholders involved, education in Detroit was once again pulled into the spotlight. Stephen Henderson of the Detroit Free Press has oftentimes been a voice of appropriately critical discourse when writing on Detroit education. 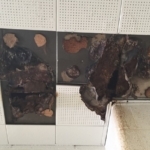 In a June article this past summer, Henderson’s disappointment was clear as lawmakers again voted to support the status quo rather than the best interest of Detroit students. Problems with sometimes shaky charter school standards (see this hilarious John Oliver segment for a roast worth watching) combined with a huge lack of resources in the Public School system are time and time again reinforced rather than broken down and solved, and as Henderson appropriately notes, it’s at the expense of the students. Even more frustrating, Henderson reminds us that Detroit’s education issues are well documented, dating all the way back to some of his initial coverage in the 90’s (I’m sure that there are plenty of other voices out there as well). So, what’s with this loop? Negative articles, especially at a local level, appropriately outline what should be massive public outrage at a broken system that was, has been, and continues to be broken. Yet, how many times do we have to go through the illogical, nonconstructive story that “Detroit education stinks. Kids literacy rates are down and schools are underfunded. Let’s do something drastic”? And why does “drastic action” like a teacher strike seemingly dissolve after the fact rather than draw attention to the absolutely absurd fact that Michigan almost didn’t pay its DPS teachers their full salary due to being so woefully out of resources (500 million dollars out of resources, actually). There’s a cyclical nature to these narratives that can’t help but make my inner cynic nauseous. All of this has been covered at length. But how much action are critics (myself included) actually willing to take? At Open Streets, I couldn’t help but be struck by the positivity displayed across our board- even in the face of public uncertainty and a negative national narrative. Never had it been more clear – the want is there – but where’s the will? I can’t help but question the dichotomous role reversal that lies at the heart of negative narratives in general. Wherever there are negative perceptions – in this case, born out of observing decision makers’ seeming ineptitude/blatant corruption, negative coverage follows and, in its own way, seemingly suppresses the stakeholders from demanding accountability in the first place. We’ve been told for so long that Detroit’s administrators and lawmakers are corrupt, but when has/will the general community stand up and take decisive action towards rectification? What does this even look like? The teachers’ strike was a step, but what happens when the problem’s repeated? 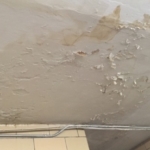 Or a kid’s poor health is finally traced back to the moldy foundations of his supposed safe haven – a school that should mark refuge, knowledge, and resources but instead simply serves as a reminder for years worth of inattention? The only fact that should matter is that in 2015, 47 out of 120 schools published in a list of Michigan’s bottom 5% of performance were DPS. To be clear, I’m not condemning Henderson or, for that matter, any media member. If anything, I laud him and other voices who have called the public to action spanning back to dates before I was even born. I also don’t mean to discount the phenomenal efforts that many nonprofits have gone through to bolster Detroit’s educational systems and provide vital supportive framework as an aid to so many. I seek only to draw attention to the systemic way that discourse and public perceptions seem to allow this whole thing to exist – even prosper, for so long. All that we’ve seemed to be able to manage is facilitate annoyance, brief conversation, and inevitable relapse rather than provoking – or perhaps demanding, well, something better. Surely, we must realize that holistic education must accompany Detroit’s holistic revival, right? The wish is there along with the efforts of a dedicated minority – but where’s the systemic process to make it happen?